Peritoneal lymphomatosis is relatively uncommon cause of diffuse malignant peritoneal disease, and differentiating it from other causes of diffuse peritoneal disease such as peritoneal carcinomatosis is often difficult on imaging. Common findings observed in peritoneal lymphomatosis in contrast to other etiologies include frequent nodal involvement and splenomegaly. We present a case of diffuse peritoneal disease along with ovarian lesions in the absence of abdominal lymphadenopathy or splenomegaly on fluorodeoxyglucose positron emission tomography–computed tomography in the setting of elevated cancer antigen-125 levels, mimicking primary ovarian malignancy causing peritoneal carcinomatosis, which was finally proven to be lymphoma. Diffuse peritoneal disease is one of the commonly encountered findings in oncologic imaging. Peritoneal carcinomatosis is the most common cause, usually spreading from ovarian, colorectal, gastric, or breast cancer. Other causes include peritoneal lymphomatosis, primary peritoneal tumors, and peritoneal tuberculosis. Although it is often difficult to differentiate each other on imaging, early diagnosis is essential as the prognosis and management differ significantly. Lymphoma being a great mimicker can rarely present as diffuse infiltration of the peritoneum. Common findings observed in peritoneal lymphomatosis in contrast to other etiologies include frequent nodal involvement and splenomegaly. A 45-year-old female presented with abdominal distention for 1 month duration. She was found to have diffuse irregular omental and mesenteric thickening, bilateral enlarged ovaries, and pleural effusion on computed tomography (CT) scan. Cancer antigen (CA)-125 level was elevated (356 IU/ml) and carcinoembryonic antigen was normal (<0.2 ng/ml). 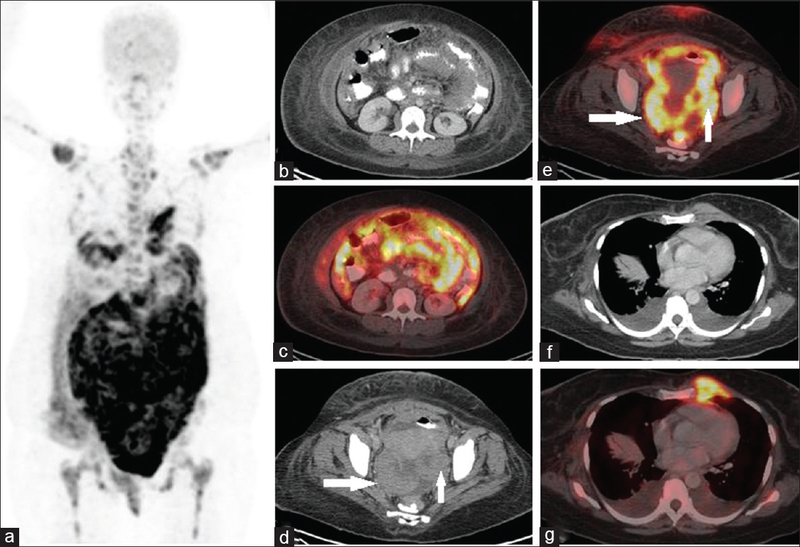 Clinically, metastatic ovarian cancer was considered and referred for whole-body F-18 fluorodeoxyglucose positron emission tomography–CT (FDG PET CT) [Figure 1]a, [Figure 1]b, [Figure 1]c, [Figure 1]d, [Figure 1]e, [Figure 1]f, [Figure 1]g, which showed intensely FDG-avid diffuse soft-tissue thickening in the peritoneum, omentum, mesentery, along the serosal surface of small and large bowel loops, and FDG-avid lesions in both adnexae (white arrows). In addition, FDG-avid soft-tissue lesions were also seen in anterior abdominal wall and left parasternal region along with metabolically inactive bilateral mild pleural effusion. No splenomegaly or significant lymphadenopathy was noted, except for few FDG nonavid small nonspecific retroperitoneal lymph nodes. In view of the presence of ovarian lesions with high CA-125 levels in the absence of significant lymphadenopathy or splenomegaly, the possibility of metastatic ovarian cancer was raised. Omental biopsy showed features of lymphoma [Figure 2]a and [Figure 2]b. Immunohistochemistry showed positivity for CD 20 [Figure 2]c, CD 10, bcl2, and cMyc and negativity for TdT, cyclin D1, and CD 30; admixed CD3-positive T-cells were also seen and approximately 30% of cells were bcl6 positive with Ki 67 index of approximately 80% [Figure 2]d, suggestive of diffuse large B-cell lymphoma-Germinal center origin–double-expressor type. Causes of diffuse peritoneal diseases include peritoneal carcinomatosis, peritoneal lymphomatosis, malignant peritoneal mesothelioma, diffuse peritoneal leiomyomatosis, splenosis implants, peritoneal tuberculosis, and IgG4-related disease.,, Since most of them present with nodular or diffuse peritoneal thickening with invasion of omentum (caking) and mesentery, it is often difficult to differentiate each other on imaging. However, accurate early diagnosis is essential as the prognosis and management of each condition vary significantly. Findings which favor peritoneal lymphomatosis on imaging are frequent lymph nodal involvement (particularly bulky, nonobstructing, homogeneous retroperitoneal or preaortic lymphadenopathy, elevating the aorta off the spine “floating aorta sign,” or encasing the mesenteric vasculature the “sandwich” sign) and splenomegaly.,, The presence of any lesions in possible primary sites such as ovary, colorectum, pancreas, stomach, or breast would usually suggest peritoneal carcinomatosis, where lymphadenopathy if present is locoregional with respect to the primary site and may show heterogeneous enhancement/necrotic changes on CT. 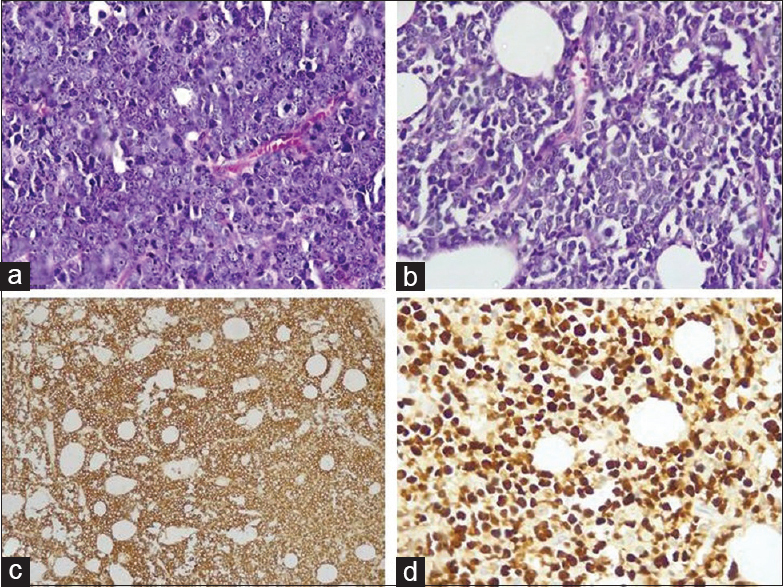 This case emphasizes the fact that the presence of ovarian lesions and elevated CA-125 levels in patients with diffuse peritoneal disease does not exclude the possibility of lymphoma, even in the absence of supporting findings like lymphadenopathy or splenomegaly. Baratti D, Kusamura S, Deraco M. The fifth international workshop on peritoneal surface malignancy (Milan, Italy, December 4-6, 2006): Methodology of disease-specific consensus. J Surg Oncol 2008;98:258-62. Diop AD, Fontarensky M, Montoriol PF, Da Ines D. CT imaging of peritoneal carcinomatosis and its mimics. Diagn Interv Imaging 2014;95:861-72. Sia DS, Kapur J, Thian YL. Peritoneal lymphomatosis mimicking peritoneal carcinomatosis: Important imaging clues for correct diagnosis. Singapore Med J 2013;54:e93-6. Thomas AG, Vaidhyanath R, Kirke R, Rajesh A. Extranodal lymphoma from head to toe: Part 2, the trunk and extremities. AJR Am J Roentgenol 2011;197:357-64. Vadi SK, Parihar AS, Kumar R, Singh H, Mittal BR, Bal A, et al. IgG4-related disease simulating carcinoma colon with diffuse peritoneal carcinomatosis on 18F-FDG PET/CT. Clin Nucl Med 2018;43:e247-9. Hedgire SS, McDermott S, Borczuk D, Elmi A, Saini S, Harisinghani MG, et al. The spectrum of IgG4-related disease in the abdomen and pelvis. AJR Am J Roentgenol 2013;201:14-22. Hardy SM. The sandwich sign. Radiology 2003;226:651-2. Bligh MP, Borgaonkar JN, Burrell SC, MacDonald DA, Manos D. Spectrum of CT findings in thoracic extranodal non-Hodgkin lymphoma. Radiographics 2017;37:439-61. Spitzer M, Kaushal N, Benjamin F. Maternal CA-125 levels in pregnancy and the puerperium. J Reprod Med 1998;43:387-92. Miralles C, Orea M, España P, Provencio M, Sánchez A, Cantos B, et al. Cancer antigen 125 associated with multiple benign and malignant pathologies. Ann Surg Oncol 2003;10:150-4. Al-Musalhi K, Al-Kindi M, Ramadhan F, Al-Rawahi T, Al-Hatali K, Mula-Abed WA, et al. Validity of cancer antigen-125 (CA-125) and risk of malignancy index (RMI) in the diagnosis of ovarian cancer. Oman Med J 2015;30:428-34. Abd El Gawad IA, Shafik HE. CA 125, a new prognostic marker for aggressive NHL. J Egypt Natl Canc Inst 2009;21:209-17.